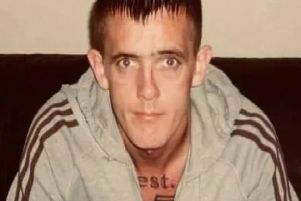 Two killers prowled the streets of Hartlepool in search of Hartlepool mum of three Kelly Franklin. Torbjorn Kettlewell has been found guilty of the murder of the mum of his three children Kelly Franklin, who he stabbed to death in the street. Kelly Franklin caught on CCTV minutes before she was stabbed to death by Torbjorn Kettlewell. Kettlewell's former lover Juile Wass has been found guilty of her manslaughter. Police who investigated the case have released video footage showing hows the two killers spent the hours before Kelly's tragic death and went on to scour the streets of Hartlepool looking for their victim. Kettlewell is seen on CCTV going into a local shop and looking around the streets in search of Kelly. Police then spot the car carrying Kettlewell and Wass as they search for the mum of three. Torbjorn Kettlewell caught on CCTV before stabbing Kelly Franklin to death. CCTV from a bus then catches images of Kelly Franklin minutes before she is stabbed to death by Kettlewell in Oxford Road, Hartlepool.